At an early age, Sabrina Greenfield displayed a commitment to the fair treatment of all, a passion that others should register to vote, and keen interest in and sensitivity to diverse cultures and gender issues. Sabrina Greenfield was a resident sophomore in College Ten majoring in Feminist Studies when she died tragically in September 2006, at the age of nineteen. To honor her memory, her family, friends, and colleagues established the Sabrina Greenfield Memorial Award. 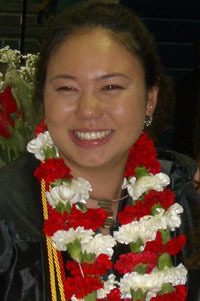 Sabrina was born in Hayward, California, and moved with her family to the Federated States of Micronesia when she was two years old. During her nine-year stay in the Pacific islands, Sabrina loved swimming in warm, shallow lagoons, making friends from different cultures, and eating delicious local foods. With no island access to TV, she especially looked forward to receiving back issues of off-island newspapers to get a glimpse of what was going on in the rest of the world. Sabrina was eager to see it all. Sabrina’s family moved back to the U.S., and she lived in Vienna, Virginia, where she graduated from high school. Everyone who knew Sabrina quickly learned that she was inquisitive, open-minded, lively, and loved all sports. She enjoyed playing on her school and community basketball, soccer, and crew teams. Sabrina was thrilled when the local youth sports organization awarded her a scholarship to attend UC Santa Cruz. At an early age, Sabrina displayed a commitment to the fair treatment of all, a passion that others should register to vote, and keen interest in and sensitivity to diverse cultures and gender issues. She always cherished her family and many friendships. Sabrina believed that her life at UCSC in College Ten and her major in Feminist Studies truly reflected her beliefs and her passion for social justice. Sabrina’s life was a gift to all who knew her. Her family and friends wish to acknowledge and remember Sabrina through the Sabrina Greenfield Memorial Award. This award is based on academic merit and financial need and is open to College Ten undergraduates at the sophomore, junior, or senior level who are majoring in Feminist Studies. For more information regarding this award, please contact the College Ten administration office (831) 459-5852 or visit College Ten's website.